36 THE SHOP JANUARY 2019 A s technology becomes an even more important aspect of vehicle person- alization, manufacturers are showing off products on featured vehicles in their trade and consumer show booths. Years ago, no one would have thought the SEMA Show would be the place to market 12-volt solutions. But shops are anxious to enter into new territories where profits are high—especially when the manufacturer has done its homework and created solu- tions that are easy to install. Who doesn't like plug-and-play? The 2018 SEMA Show featured man- ufacturer-engineered solutions that are attractive to vehicle customization shops as well as mobile electronics retailers. The bottom line is that everyone can get along and get into the game, with nearly 300 million vehicles out there on U.S. streets. Most vehicles are candidates for upgrades, and some owners are itching to add better technology and infotainment. SEMA has been the place to introduce these prod- ucts that a variety of installation techs can install with a little knowledge and proper test equipment—and see them installed in demo vehicles. PARTY IN THE BACK One inventive sound system introduced at SEMA was from KICKER. Rather than catering the sound to the passengers in the truck cab, it brings the party to the tailgate. The company developed a sound system for the drop-down tailgate in the GMC Sierra pickup. It is called the MultiPro. As Kicker puts it: "It provides the perfect vibe for the party or jobsite." There is a built-in tilt-sensor electronic module to sense when the gate is raised or lowered. This way, it will turn on and off automati- cally without any additional hassle from the user. It features an independent 100-watt amplifier, a charging USB port and a pair of weatherproof speakers. "KICKER is excited to bring this dynamic, exterior-listening audio system to GMC trucks and consumers," says Joe Gross, OEM director of sales. "We feel it will com- pletely change the way a consumer will make use of the truck bed and tailgate." The unit is available for new GMC Sierra SLT, AT4 and Denali models. The audio system of the MultiPro Tailgate System con- nects to the customer's smart- phone via Bluetooth. It plays through two 4-inch weather- proof coaxial drivers, indepen- dent of the interior audio system, to bring the music outside and around the truck. It is a low-current-draw system made to play outside for hours. According to the company, the system is rugged and ready for any weather, heavily field-tested and proven to withstand the elements. Consumers can expect a tough tailgate with full structural integrity for regular truck use, including the ability to accept OEM-certified light kits. The electronics inside are protected by an ABS custom baffle that is fully gasketed to prevent seeping moisture or dirt. The integrated T-harness, connectors and plugs are weather-resistant. The built-in 1-amp USB port will charge a phone, and it will also accept and play audio from a USB memory stick. UNDER CONTROL AudioControl was a newcomer at SEMA. The company has been producing high- end audio equipment that can be easily integrated into factory sound systems for more than 30 years. 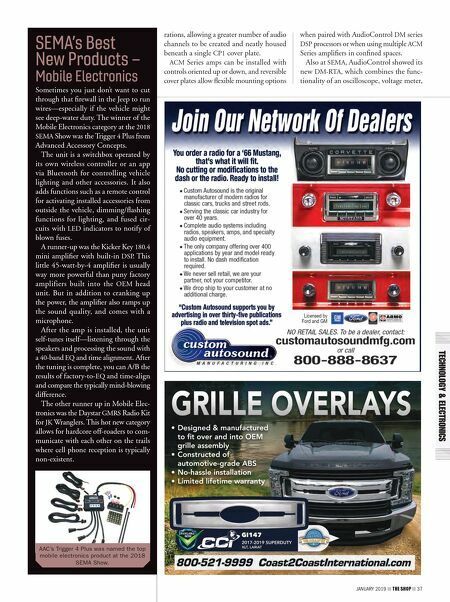 It hit the SEMA Show to showcase its ACM amplifiers. Since they are only 1.5- inches high, the amps work well for resto- mods, rat rods and exotics, where they can be tucked neatly under seats or in other nooks and crannies. AudioControl's patent-pending mod- ular configurable ACM system concept enables installers to bring together a number of amplifiers in various configu- See It at the Show Electronic upgrades are a growing aspect of vehicle customization. 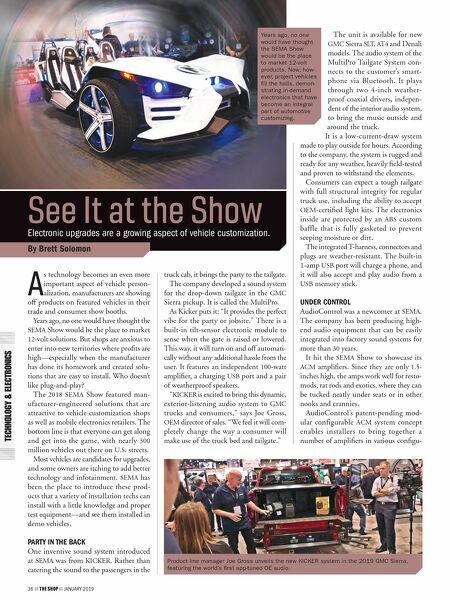 By Brett Solomon Years ago, no one would have thought the SEMA Show would be the place to market 12-volt products. Now, how- ever, project vehicles fill the halls, demon- strating in-demand electronics that have become an integral part of automotive customizing. Product line manager Joe Gross unveils the new KICKER system in the 2019 GMC Sierra, featuring the world's first app-tuned OE audio.